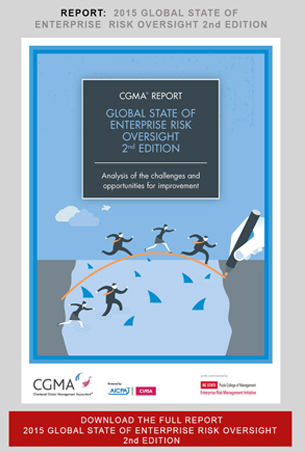 NC State’s ERM Initiative, in partnership with the Chartered Global Management Accountant (CGMA), has just released its report, Global State of Enterprise Risk Oversight 2nd Edition: Analysis of the Challenges and Opportunities for Improvement. Based on survey responses from over 1,300 business executives in organizations around the world, the report provides insights on the current state of enterprise-wide risk oversight, including identified similarities and differences in various regions of the world. 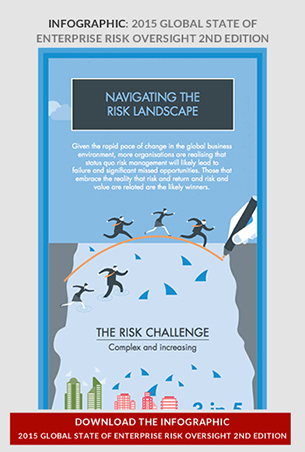 Organizations around the world face a similar volume and complexity of risks – no region is uniquely different in that perception. Surprisingly, an overwhelming majority of management respondents in all regions of the world believe their current risk oversight processes are relatively immature. About 1/3 of organizations in Europe, Asia & Australasia, and Africa & Middle East believe they have complete enterprise risk management in place, as compared to only 24% in the U.S.
Around 60% of organizations in Europe, Asia & Australasia, and Africa & Middle East describe their ERM process as systematic, robust, and repeatable while only 29% of US organizations describe their processes in that manner. Less than 30% view their risk management process as providing competitive advantage. 70% or more of boards in all regions of the world outside the U.S. are formally assigning risk oversight responsibilities to a board committee. Surprisingly, only 46% of U.S. boards are doing so. Few organizations (about 20%) integrate risk management activities with performance compensation and most (about 80%) have not invested in risk management training for executives. Across most dimensions, enterprise risk oversight in U.S. organizations is lagging in its maturity relative to organizations in other regions of the world. Boards and senior executives may benefit from an honest assessment of the efficacy of the organization’s current approach to risk oversight. Organizations have managed risks for decades often by having business functions manage specific types of risks with little coordination among those functions. Business leaders may want to consider the extent to which critical risks may occur and not be detected by silo managers. Because organizations understand the importance of taking risks to generate returns, executives should consider whether their risk oversight efforts are providing valuable input to the strategic planning process. For enterprise risk oversight to be a strategic tool, most organizations realize that risk management needs to move from a casual, ad hoc way of thinking to a structured and explicit set of risk identification, assessment and monitoring processes. The board and senior management may need to evaluate whether they have the right leadership structure to provide the needed guidance to ensure risk oversight is integrated effectively with the strategy of the organization.